Product selection, shopping experience, and seller tools are three crucial areas of focus for eBay going forward. eBay (NASDAQ:EBAY) is going through a transformation. The company comes in well behind Amazon (NASDAQ:AMZN) in e-commerce, and management is implementing multiple strategies to reduce the competitive gap and jump-start performance. If the company can deliver on accelerating growth, then the stock should offer plenty of upside potential for investors. The e-commerce revolution is here to stay. Consumers around the world are increasingly going online to purchase all kinds of products, and online is rapidly gaining share versus brick-and-mortar retail. According to official statistics, e-commerce still accounts for a modest 7.5% of all retail transactions in the U.S., indicating that the industry still offers enormous potential for expansion going forward. 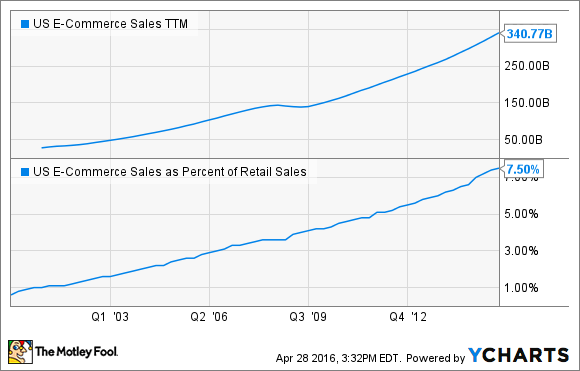 US E-Commerce Sales TTM data by YCharts. However, Amazon is capturing most of that growth nowadays, while eBay is considerably lagging. Based on estimates from ChannelAdvisor, Amazon registered a 14.9% increase in same-store sales during March of 2016, basically in line with a 15% increase for the e-commerce industry as a whole. eBay, on the other hand, registered a disappointing decline of 0.2% in same-store sales during the month. But eBay is not sitting still. The company is planning to accelerate performance by improving its product offerings, building a better shopping experience, and providing more powerful tools for sellers. Product variety and selection are crucial in terms of attracting more customers to the platform, so eBay is actively working on expanding its inventory. The company added 16 million unique products to its catalog in the first quarter of 2016, and the platform now features 900 million live listings available at any time. The company is also building partnerships with service providers such as BigCommerce and inkFrog in order to make it easier for sellers to list their inventory on eBay's marketplace. Brand power is a crucial consideration in retail, especially in clothing and accessories. With this in mind, eBay has recently launched brands such as Vince Camuto and Samsonite on its U.S. platform. The company is also working with Adidas to open showrooms on eBay across the main European markets later this year. eBay has recently launched eBay Wine, a new platform featuring the ability to browse and purchase collectible, rare, and everyday wines based on characteristics such as varietal, region, and price point. The site will also feature guides and tips by industry experts in order to make the user experience friendly and approachable. Sellers on eBay used to be allowed to write whatever they wanted as a product description, but that made the shopping experience quite confusing and unpredictable, especially as the platform gained size over the years. For this reason, eBay is now working on making the shopping experience simpler, more data driven, and personalized. The company is prioritizing unique products and requiring sellers to include standardized data about their offerings, as well as building more catalogs and enhancing content with images and other relevant information. In addition, eBay has recently launched the ability for users to search on the platform using a product identifier directly in the search bar, quickly returning relevant items. This is aimed at not only providing a better experience for buyers, but also driving more SEO traffic from search engines like Google. Management fully acknowledges that the company needs to do much better in mobile, a crucial growth segment in the industry. For this reason, eBay is currently testing a new mobile app which the company expects to roll out sooner rather than later. The company is also working on a pilot integration enabling eBay users to receive activity notifications through Facebook Messenger. Unlike Amazon, which is seen as a dreaded competitor by many brick-and-mortar retailers, eBay is mostly a valuable partner to sellers. The company is offering improved tools for those sellers to deliver the right merchandise to the right buyers at the right price. eBay's marketplace platform generates massive amounts of data, and the company is leveraging that information to show sellers which particular products are selling better than others on the platform, and how to implement the right pricing strategies based on the supply-and-demand trends. More than 25,000 sellers on eBay are now using the new Seller Hub data to manage their businesses, and the company plans to roll out Seller Hub to all sellers this summer. eBay is also introducing more options to simplify selling, such as its professional selling service Valet, and its partnership with on-demand shipping and packing company Shyp. Besides, promoted listings give sellers another way to attract more buyers to their best items. If sellers have the right tools, it will be easier for them to attract more buyers to the platform, and this should drive accelerating growth. At the end of the day, what's good for buyers and sellers in the platform should also be good for investors in the company.